You can enable additional networking features in the Smoothwall System to tighten network security. 1. Go to Network > Settings > Advanced.  ICMP ping broadcast — Internet Control Message Protocol (ICMP) ping broadcasts are used to determine to determine the status of network devices. It can be used as a denial of service (DoS) attack. Select this option to prevent the Smoothwall System from responding to ping broadcast messages from all network zones, including external zones. 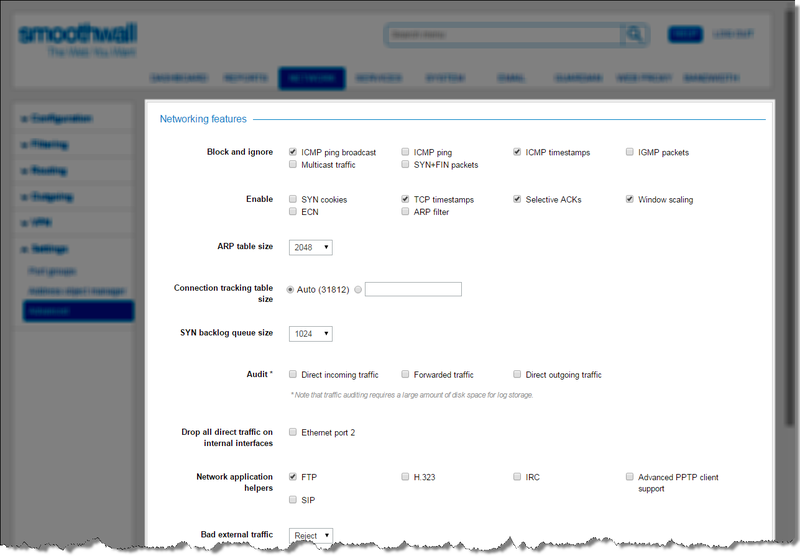 Select this option to block all ICMP ping requests going to the Smoothwall System. This effectively hides the Smoothwall System from ICMP pings, but can also make connectivity problems harder to diagnose. Select this option to block all ICMP timestamp requests going to the Smoothwall System.  IGMP packets — Internet Group Management Protocol (IGMP) is used to establish multicast group membership. Typically, IGMP packets are harmless, and are most commonly observed when using cable modems to provide external connectivity. Select this option to ignore all IGMP packets without generating log entries. Select this option to block all multicast traffic on address 224.0.0.0 from ISPs, and prevent them from generating large volumes of spurious log entries.  SYN+FIN packets — Typically SYN and FIN scans generate large numbers of log entries. Select this option to automatically discard packets used in SYN+FIN scans.  SYN cookies — The use of SYN cookies is a standard defence mechanism against a SYN flood attack, where a large number of SYN packets (connection requests) are sent to a machine as a DoS attack. Select this option to defend against SYN flood attacks. Select this option to enable TCP timestamps to improve TCP performance in high speed links. Select this option to enable selective ACKs (acknowledgements) to improve TCP performance in links where packet loss is high. Select this option to enable TCP window scaling to improve TCP performance in high speed links.  ECN — Explicit Congestion Notification (ECN) is a mechanism for avoiding network congestion. While effective, ECN requires communicating hosts to support it and some routers are known to drop packets marked with the ECN bit. For this reason, this feature is disabled by default. Select this option to enable ECN.  ARP filter — The Address Resolution Protocol (ARP) filter filters out ARP flux. Select this option to enable the ARP filter. You can change the maximum number of remembered hosts in the ARP table if the number of directly connected machines, or IP addresses, is more then the value shown in the drop-down box. Directly connected machines are those which are not behind a intermediate router but are instead directly attached to one of the Smoothwall System's network interfaces. Typically, the default value of 2048 is adequate, but in very big networks, select a bigger value. Information about all connections known to the system is stored in the connection tracking table, including NAT-ed sessions, and traffic passing through the firewall. During operation, the table is automatically scaled to an appropriate size within a specified limit, according to the number of active connections and their collective memory requirements. Occasionally, the default maximum number of connections to track, which is set according to the amount of memory, is insufficient. Configure a large table size in the space provided. You can change the maximum number of requests in a queue, waiting to be answered. Increasing the value may reduce connection problems for an extremely busy proxy service. Select to logs all new connections to all interfaces that are destined for the firewall. Select to log all new connections passing through one interface to another. Select to log all new connections from any interface. Note: Typically, traffic auditing generates large amounts of data. You must ensure there is sufficient disk space in the Smoothwall System before enabling this — see Managing Datastore Log Retention. You can view traffic audit logs from Reports > Logs > Firewall — see Viewing Firewall Logs. This option is for internal interfaces that have hosts attached on them. Enabling this option drops all direct traffic to those interfaces, but allows access to other internal networks connected to the Smoothwall System. Network application helpers enable specified traffic to pass through the firewall correctly.  FTP — IP information is embedded within File Transfer Protocol (FTP) traffic. This application helper ensures that FTP active mode client connections are not adversely affected by the firewall.  H.323 — This application helper enables pass-through of H.323 traffic, a common protocol used in voice over IP (VoIP) applications. It is also possible to receive incoming H.323 calls through the use of a port forward on the H.323 port. This option is disabled by default because of a theoretical security risk associated with the use of H323 passthrough. It is recommended you only enable this feature if you require VoIP functionality.  IRC — IP information is embedded within Internet Relay Chat (IRC) traffic. This application helper ensures that IRC communication is not adversely affected by the firewall.  Advanced PPTP client support — This application helper enables Point-to-Point Tunneling protocol (PPTP) client traffic. This is the protocol used in standard Windows VPNs. When disabled, it is still possible for PPTP clients to connect through to a server on the outside, but not in all circumstances. Difficulties can occur if multiple clients on the local network wish to connect to the same PPTP server on the Internet. In this case, this application helper should be used. When enabled, it is not possible to forward PPTP traffic. For this reason, this option is not enabled by default.  SIP — IP information is embedded within Session Initiation Protocol (SIP) traffic. This application helper ensures that SIP communications are not adversely affected by the firewall. Bad external traffic, such as those being address to ports but without any content, is rejected and a “No one here” ICMP message bounced back to the sender.  Reject — The Smoothwall System notifies the sender when bad external traffic is rejected.  Drop — The Smoothwall System silently drops bad external traffic, enabling you to “stealth” your firewall, making port scans, and so on, much harder to do.